Clearing your browsing history, cookies, form data, tracking permissions and other data is made easier with the Microsoft Edge aka Project Spartan. 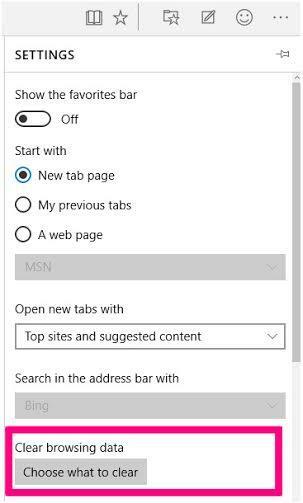 Learn how you can clear your cache and other data with the new browser to replace Internet Explorer. Your browsing history (the information that your browser remembers and stores on your PC) can enhance your browsing experience, especially if you allow it to save information you fill in on forms, passwords and cookies from websites that you visit regularly. But if you are using a public or shared PC, you may not want the browser to remember these details. Clearing your cache with Microsoft Edge is different (and easier) than with Internet Explorer. There are far fewer steps involved, since your settings are more easily accessible. Follow the steps below to clear your browsing history, cookies and saved website data, cached data, download history, form data, passwords and more with two clicks. Bring your cursor (or tap, if you are working on a touchscreen device) to the top right corner of your browser. Here you will find the "More Actions" menu in the icon with the ellipses. 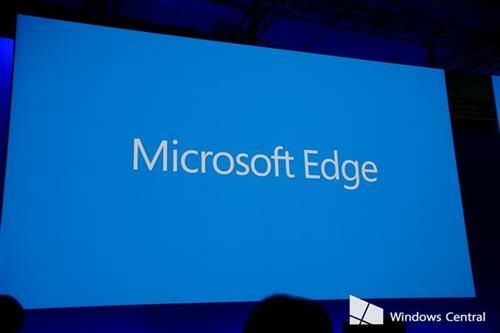 Clicking on it will open up a menu, from which you can access your Edge settings. When you hit Settings in the "More Actions" menu, you will see the options to configure how your browser looks on startup, change the visibility of the Favorites Bar and so on. Scroll down to find the "Clear Browsing Data" option. 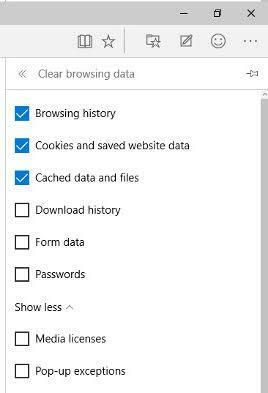 Below the "Clear Browsing Data" option, you will find the option to "Choose what to clear". Select it, and you will find a list of data types you can clear. The "Browsing history", "Cookies and saved website data", "Cached data and files" will be automatically checked, but you can un-check the caches you don't want to clear. In addition, you can check the "Download history", "Form data" and "Passwords" boxes to delete those data as well. These options are all familiar to Internet Explorer users and users of most other standard browsers. But Microsoft Edge gives you some additional options to clear. The Edge browser currently gives you the option to clear some additional data that you weren't able to individually on Internet Explorer. Up to IE 11, Do Not Track exceptions, ActiveX Filtering etc. were cleared together. Edge does away with ActiveX support and so you won't see it on the cache deletion menu. Instead, Media licenses, Pop-up exceptions, Location permissions, Full screen permissions and Compatibility permissions get their own separate boxes to check. You may want to delete media licenses separately if you are having licensing issues with installed software. 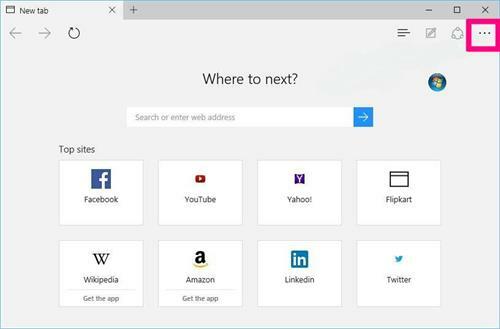 Pop-up exceptions that you have allowed (and that you no longer want to allow) and location permissions to apps and big search engines that have outstayed their welcome can all be tackled separately on the new Microsoft Edge . The one option that Edge does not allow yet (unlike Internet Explorer) is to delete browsing history on exit. Another option that many people would like to enjoy again is the Ctrl + R option to quickly clear browsing data. 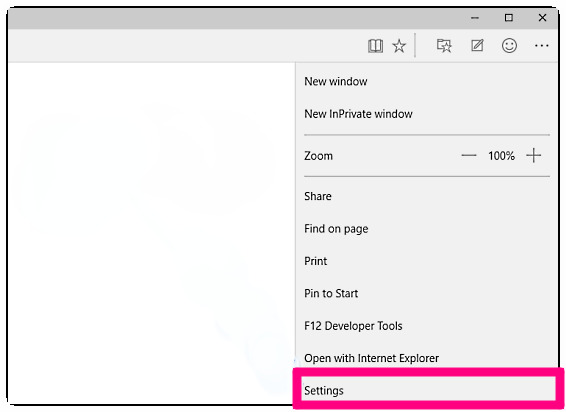 If you would like to see these options back on Edge, you can always leave a feature suggestion in the Microsoft Edge Feature Suggestion Box and keep your fingers crossed!